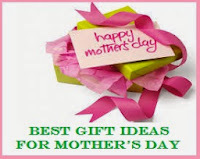 Mother's day is indeed the special day of the year when you can pamper, show your love andaffection to your loving mom. A mom is such a lovely word as she is so special and dear to everyone. She is the sweetest gift any one can get. 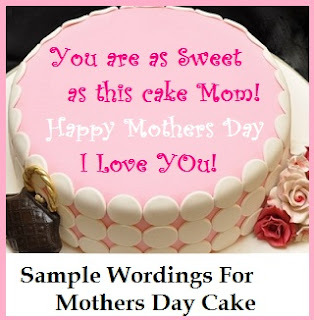 Mother's day is the perfect time of the year to express your love in words and sweet gifts. 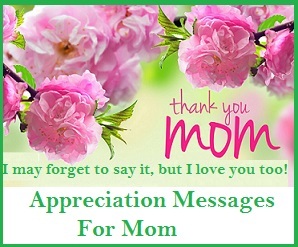 Here are some special happy mother's day messages to choose from for this mother's day celebration. 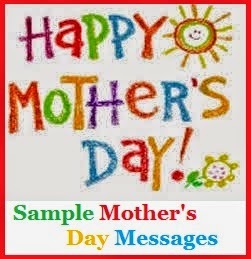 So go ahead and choose the perfect sample mother's day messages for your mom. Dear Mother, You have always been loving, patient and kind and you always put my needs above your own. I have to say that you been the most incredible woman I have seen . Happy Mother's day! You are centre of my life and you made me strong to stand on my own. My whole word began with you and all I would say on this special day is...........Happy Mother's day! Your valuable lessons and love guided me. I soared like an eagle because of you. You gave me a shoulder when I most needed it and showered me with strength, love and guidance. Thank you for all you have been....... Happy Mother's day! A million things you gave me and a whole note book wouldn't be enough to describe what you mean to me. The word "Mother" means the whole world to me. Happy Mother's day ! My dearest Mother, I hope that on this special day you are blessed with joy, love, fun and laughter .............Yours ever loving son/daughter. I am left with no words to express how you have supported me over the years. You have always been my inspirational pillar when I am down and has been mentor always . Happy Mother's Day. Dear Mother, You are Special. Like the brightest star lit in the night sky, you always fill my life with light, hope and more joy. I may be far but can always feel your presence. With loads and loads to hugs on this special day.......Happy Mother's day! Sweet Mother, You have always been my true friend. During adversities, troubles and even when my close friends deserted me, you counselled and encouraged me like a true friend. I love you today and forever... Happy Mom's Day! I am truly blessed to have a mother like you. I appreciate all your efforts to make me feel loved and cared all these years. Wishing you a Happy Mama's day and God bless! You listened to our fears and you gave ears to our cries. You are truly my hero. With lots of hugs......wishing you a Happy Mother's day. Your immeasurable sacrifices for several years made me what I am today. My dearest mom, Wishing you all the best with great big hug and warm wishes on this special day. Express your love this Mother's day with right wishes. Send your heartfelt wishes and make your mom feel special once again! 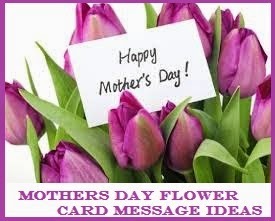 If you are looking for flower card messages for mothers day, you have reached the right spot. 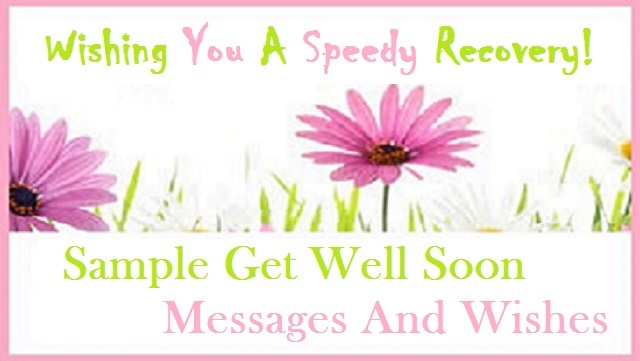 Here you will find an excellent collection ofsample flower card messages for mothers day. Read on to find the perfect flower card message for mothers day right here. Your presence makes our house a sweet home...Thank you Mom and wishing all the best! Mom, your love and kind words always meant a lot to me. Happy Mom's Day! To the best Mom in the Whole Wide World, Happy Mother's Day! For all the love, For all the encouragement, For all the Patience you took to bring me up.......Thank You. Happy Mother's Day! Thank you for being my super mom and a lovely friend.....Happy Mother's Day! For all the ways you helped me grow, I love you... Happy Mother's Day. There's never been a day when I wasn't glad about you being my mother. Happy Mother's Day! Mom, My love for you grows day by day after being a mother myself... Happy Mother's Day! Thinking of you with a joyful heart today and forever, Mom. Wishing you a Happy Mother's Day! Express your heartfelt words when you send a bouquet of flowers to your dearest mother. 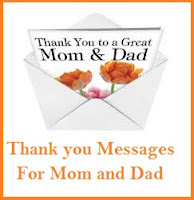 Choose the right happy mothers day message and perhaps add a word or two about your experiences, your memories and wonderful days you had with your mother. 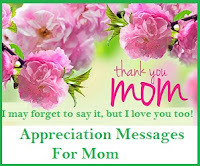 Remember, you are conveying your words to your lovely mother who deserves the best!